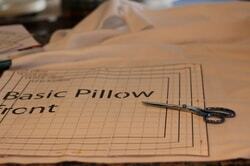 This Easy Ribbon Pillow Free pdf pattern and tutorial is a great first project. 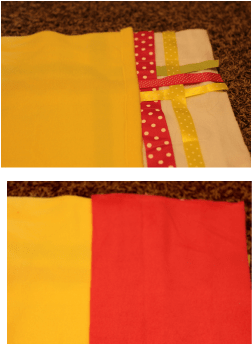 You can make a great looking pillow that adds color and style to a room and takes minutes to make. 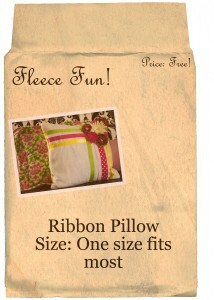 You can also sew the ribbons on in such a way that you can attach cute hair clips to it to display fun hair accessories. Download the free pattern below. 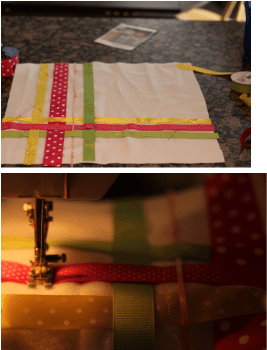 Layout and pin the ribbon in the pattern or design you want. 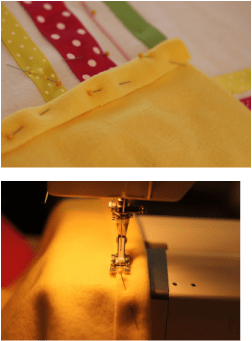 – keep in mind that if you want to be able to clip flowers to the pillow you need to be able to leave gaps in the ribbon. If you want to add flowers you can do so now. For a tutorial on the satin flowers you can go here. For a fleece flower you can go here.